This is one of the many novelty releases from Carlton Ware. 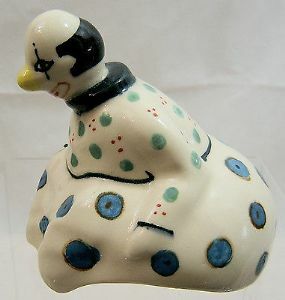 This one is a Teapot Lid from the Tumbling Clown Circus series. Designed by Roger Michell (Lustre Pottery) for Carlton Ware in 1970. Regrettably, there is no backstamp; that would be found on the base of the teapot. This offer is for those who may have, in the past, damaged their lid, so now a replacement can be found.